Copyright: Virgin Records. Goodbye Records. Amy Burrows (graphic artist). CHVRCHES. 2013. You don’t know me… and I don’t know you. So welcome to my blog. Niceties aside, it’s time to focus on some music. You may not initially like the music I like, but I can assure you it’s the shizz. Give it a fair shot. My tastes are continually being put to use in commercials and fashion shows, and you’re the one thinking, “Man, that is a GREAT song!” while I’m singing the lyrics. Now it’s your turn to be the tastemaker. This review is late, yup. Chalk it up to a bit o’ life. Luckily, chances are you’ve not all heard this album before, so read the reviews and get up-to-speed. CHVRCHES are two Scotsmen and one Scotswoman. Their beats are sick, and the vocals are lofty. Track by track: their new album “The Bones of What You Believe”. 1. The Mother We Share – This one has been getting a lot of airtime on satellite radio (AltNation and SiriusXMU, my two favorite channels). I’m apt to boredom, so perhaps my perspective on this song is slightly jaded by time. That being said, great track. It starts nice and light, and adds a pulsing, bass-heavy, 80s synth. You’re gonna wanna dance to it with a beer in your hand. While singing. Loudly. 3. Gun – Should be called “Gem”. What gets me is the raw hostility in these lyrics… it’s an incredible contrast to how light this jam is. Serious, she almost sounds a little sociopathic; I wanna close my blinds and hide from this chick. While singing this song in tiny, whimpering gasps so she doesn’t find me. 4. Tether – Originally, not quite such a fan of this one! I can’t stand slow jams. It picks up to be a little more electro-pop-dance after a brief, boring intro, but the real magic happens smack-dab in the middle at 2:42, which was my turning point. I seriously did a double-take and turned that up ALL. THE. WAY. Yes, it’s IDM, it’s not rock… who gives? This beat is on another level. And it’s just the beginning. 5. Lies – One of my faves — almost Depeche Mode-like 80s influence (first half of the song), innovative lyrics, heavy bassline. The beauty of this song is that it could be introduced on the mainstream and be accepted, but it’s dirty enough to have underground cred. 6. Under the Tide – YES! New lead. I’m loving the male vocal in this track. It’s nice to switch it up a bit every so often! Would you also believe that this is also one of those tracks where I was a bit bored overall? Yup. Lyrics: too repetitive. Beats: not progressive enough. I was disappointed here after being SO pumped from a new voice. 7. Recover – It’s-a gonna go mainstream. Like, any day. Nothing wrong with that! Dynamic track with insightful lyrics, decent beats, interest. I’ll be proud to hear it in a commercial someday. 8. Night Sky – This would be an incredible running song. Just try to resist throwing your hands up and embracing the night air at the chorus while you take that midnight jog! Now, you can’t blame anyone but yourself if you faceplant whilst tripping over your own friggin’ feet… but please comment and let us all know if that happens so we can laugh at you. 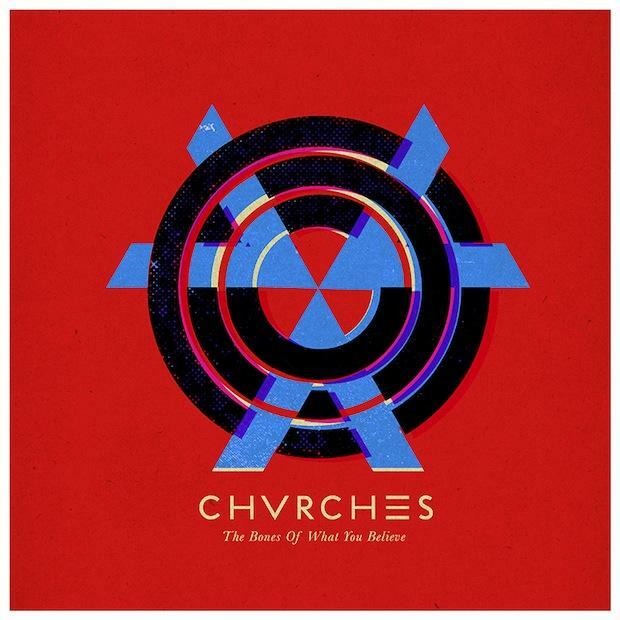 Final note: this track has one of the most WICKED bytes in the last 25 seconds… CHVRCHES! Please revisit and use in the future. 9. Science/Visions – For whatever reason I get such a Studio 54 dancefloor/Thom Yorke/Crystal Castles vibe from this. Don’t think they’d actually jive? Take a listen. Tell me your comparisons. 11. By the Throat – Coming down from our gangsta high. I almost feel like this needs to head straight to remix and get some people on the dancefloor with a bass-high. Like, ASAP. Anyone with me? Soundcloud: YOU HEAR ME?! 12. You Caught the Light – Not gonna lie: I am FURIOUS with this track placement. Not wise. I don’t wanna come down to an 80s slow jam and fall asleep after listening to your freaking album, CHVRCHES. Wanna throat-punch your producer. It is, by no means, a bad song. I can picture it as a movie sequence in something like Donnie Darko. In fact, that’s all I can think of when I hear it, which kind of depresses me. That’s a sad damn movie, mmk? Musicians, aspiring musicians, playlist-makers, take heed: DON’T PUT YOUR LISTENERS TO SLEEP AFTER A FULL ALBUM OF FUN! Unless you’re Thom Yorke. Then you can do whatever the flip you want. FINAL THOUGHTS: This album is now a regular in my rotation for the time being. I go through TONS of music, so I’ll retire a few tracks here over the next few weeks, but I can say that overall, this album is worth a listen. I’m gonna give it ♦♦♦/5.